Disclaimer: This article was posted by me somewhere else, it created so many controversies and the owner of the blog removed it. You must have seen the 2 licensed t-shirts from DC that created so many controversies around the web, where DC was accused of sexism among their online fans. 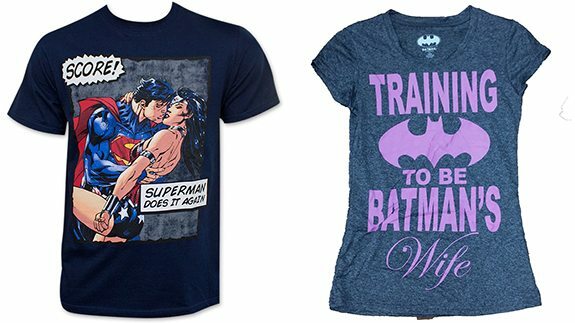 According to CBR both t-shirts present sexist messages: the first one involves Wonder Woman and Superman showing their strong feelings to each other in an embrace with the caption: “Score! Superman does it again” and the second one it’s about the caped crusader showcasing the caption: “I’m Training To Be Batman’s Wife”. Why these shirts are problematic? Well, according to CBR they showcase women in need of men. So many offended comic fans, they really need to develop a sense of humor. These licensed t-shirts aren’t created to upset or offend women, their purpose isn’t to present sexist messages. They are there to make you laugh and those who have an open mind about it, will find them hilarious. Even women. What’s so wrong about the Superman T-shirt? Weren’t they involved romantically in the actual comic book? Is that making Wonder Woman weak? “Superman Does It Again” is not misogynistic unless you want it to be. Wonder Woman chose Superman to be her lover, and he’s so lucky to be able to score with her. What’s so wrong with being Batman’s wife? Becoming or “Training to be Batman’s Wife” can be a privilege for others. And I don’t mean that in a bad way. You’ll have to be a strong, intelligent, skilled and able to not always depend on Batman; he has million of people to save, not just one. I understand how “training” to be someone’s wife isn’t the best choice of words, but there are lots of women who find this shirt awesome and funny. I’m having trouble to see the actual problem here and I’m a woman. There’s real sexism and real gender issues in this world. Is this really one of them? If you don’t like it, don’t buy it! There are other women who like and would have bought this t-shirt.